Come to Felicity Harmony Apartments, where we have undergone historic preservation to become suitable for your next home. Rental assistance is provided based on your adjusted income, according to Section 8. Unlike most high end historic apartment communities in New Orleans, to make our apartments more affordable, Felicity Harmony accepts residents who have Section 8 Housing Choice Vouchers. 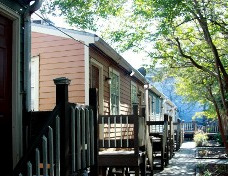 To provide you with the best living experience possible, we comply with Section 8 housing rules. Since 1988, we have passed more than 1,000 move-in and yearly inspections. With more than 25 years of experience, we understand the rules and rent to people with Section 8 certificates. Our experience with Section 8 allows us to act as knowledgable advocates for you as a tenant. Broadly, your rent as a Housing Choice Voucher Holder is calculated at 30% to 40% of your Income after deducing $480 per child per year or after deducing $400 per year if you are elderly or disabled. Please use or Section 8 Rent Calculator to approximate the rent you will be expected to pay. The Housing Authority of New Orleans, not Felicity Harmony, determines your rent. Contact us if you are in need of rental assistance when looking for a new home.